Rear Admiral Turner carefully refrained from putting any such hope or prediction into print. 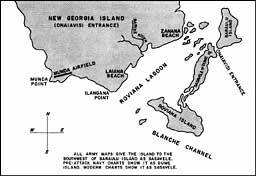 His "Concept of Operation" in Op Plan 8-43 merely echoed Vice Admiral Halsey's directive which called for the initial movement of Marines and Army troops onto New Georgia Island "at the first favorable opportunity."
. . . [Munda] is a most magnificent defensive area from the sea. There is a dense jungle behind. In front is the Munda Bar. . . . The water is chock full of reefs. . . .
Vice Admiral Halsey had directed that no assault landing on Munda airfield or surface ship bombardment of Munda airfield could be carried out without his personal permission prior to D plus nine (July 8). Then he had changed this restrictive date to D plus ten.3a This order was issued long days before the infiltrating troops on New Georgia Island started to run into major difficulties, but despite this the spirit of optimism for early major success pervaded the whole Task Force and its accompanying newspaper correspondents. 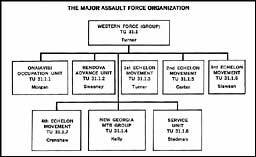 The operations of the Task Group designated the Western Force in TOENAILS during the first two weeks will be detailed first and then those of the Task Group designated Eastern Force. Following this, the landing operations of the Northern Landing Group will be told. Bad weather was a major hindrance for military operations in the Central Solomons on 30 June 1943, D-Day for TOENAILS. Commander Aircraft Solomons (COMAIRSOLS) had reported late on the 29th that he could carry out no bombing operations on the 30th, "unless the weather clears," and that his information of enemy movements in the area was limited.5 LCI(L)-333, the day before the actual landing, reported "sea rough; wind force 9" and that there were heavy swells, which would indicate that some young man was vastly underrating what a force 9 wind would and could do. Weather enroute to Rendova--low ceilings, moderate showers, poor visibility in showers, surface wind SE, force four, shifting and gusty in showers, choppy seas. Logs of the larger ships participating in the TOENAILS landings on 30 June show that it rained hard off and on during the night, then poured during the landings and on into the morning. Stormy and rainy weather continued to plague the landing craft during the early days of TOENAILS. On July 1st, 2nd, and 3rd the seas were moderate to heavy with a force 4 wind. LCT-129 lost its ramp in the heavy seas and arrived back at the Russells with three feet of water on her tank deck. The LCIs had to reduce their speed from 12 knots to 8.5 knots due to head-on seas on the 2nd of July. on 3 July but all craft made it independently into Oleana Bay, New Georgia. LCT-322 broached and was carried high and dry on the beach, where she remained until 6 July when she was refloated by the aid of tugs. Screening Group TG 31.2 Captain T.J. Ryan, Jr.
Several differences will be noted between the amphibious ships and craft listed above and on later pages for the various tasks and echelons and those listed in Samuel E. Morison's account of the invasion of New Georgia. Morison's listings appear to have been taken from the basic operation orders, while the listings herein were made up from the issued revisions to the basic orders, war diaries, action reports, and despatches, and are believed far more accurate since last minute changes were made. The major task of the amphibians of the Western Force was to get the 6,300 troops in the 1st Echelon ashore at Rendova Island on D-Day. New Georgia Island, Onaiavisi Entrance. the troops from Rendova were to land to commence their flank attack on Munda airfield. Since the minor task was to be undertaken first, it is described here first. Two miles east of the eastern end of the Munda airstrip on New Georgia Island is Ilangana Point, and the western end of the 25-mile long Roviana Lagoon. Onaiavisi Entrance, a block-busting name even for the South Pacific, separates Dume (Sasavele) Island and Baraulu Island, which together with Roviana Island and many smaller islands and long coral reefs, guard the western end of Roviana Lagoon and mark the northwestern boundary of Blanche Channel which separates Rendova and New Georgia Islands. Laiana Beach, just north of Ilangana Point, was a fair beach and a logical place to land to start an assault on Munda airfield. However, Laiana Beach reportedly was defended, while equally good Zanana Beach, two and a half miles, several rivers and creeks and some densely jungled area to the eastward, was not defended. Having accepted this Scheme of Maneuver, it was essential for the amphibians also to land troops on the islands controlling the direct approach to Zanana Beach. However, it can be said in behalf of these two ships that they landed their troops at the appointed hour and at the appointed beach. No alert Japanese artillery man hauled up a battery to take the Zane under fire when she was a stranded duck only five miles from Munda Airfield, and no alert Japanese pilot picked out the Zane for a bombing or strafing run when heckling the transports on the 30th of June. The troops of the 169th Infantry were in a position to hold Onaiavisi Entrance against the hour when Major General Hester would want to begin the shore to shore movement of the New Georgia Occupation Force to Zanana Beach. Rendova Harbor was actually only a well-protected cove fronting about a mile and a half of beach area where the shoreline curved inland about three-quarters of a mile at the northwestern tip of Rendova Island. There were numerous unmarked shallow areas in the cove, and the beach gradient was very gentle. 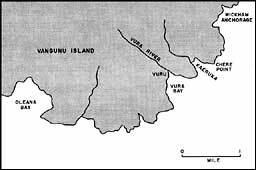 Bau Island and Kokurana Island guarded the principal narrow northern entrance to Rendova Harbor, and Lumbari Island guarded the harbor to the westward. The 3,400 feet at which the island peaked out would make a fine observation post for all activity within a range of 20 miles. 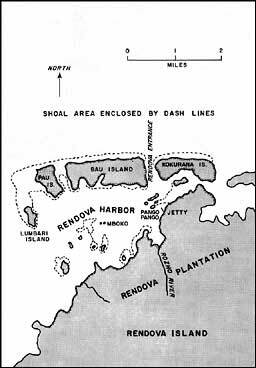 The short seven miles separating its outlying islands from Munda airfield would permit 155mm artillery emplaced on Kokurana Island just north of Rendova Harbor to deny the Japanese use of the airfield. 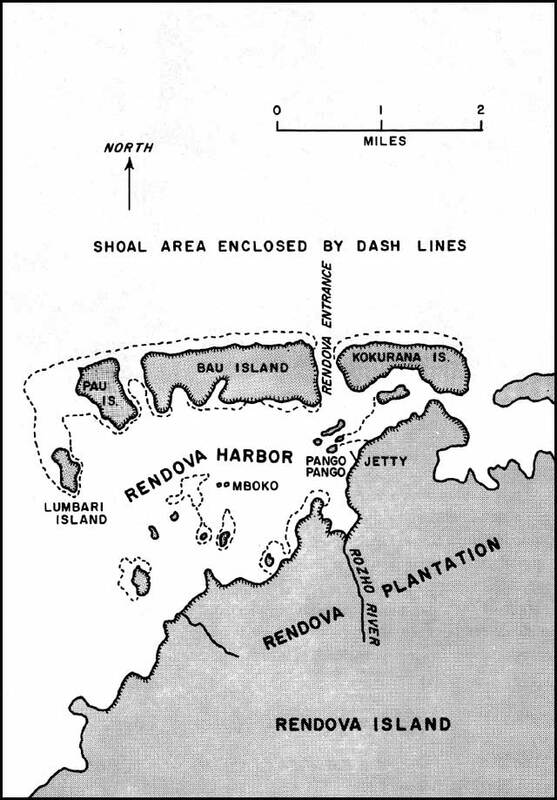 Lever Brothers' 584 acre plantation would provide a reasonably good staging area for the troops who would move by small landing craft and boats from Rendova to Zanana Beach on New Georgia Island to strike at Munda Airfield. the Ugeli Attack Unit, which was to land its troops on the northeast coast near Ugeli Village and capture the 22-man Japanese garrison reported there in late May. the Rendova Advance Unit, which was to land its troops on beaches southeasterly and southwesterly from the Renard Entrance to Rendova Harbor to act as a covering force for the major landing of the 43rd Division troops on these same beaches. 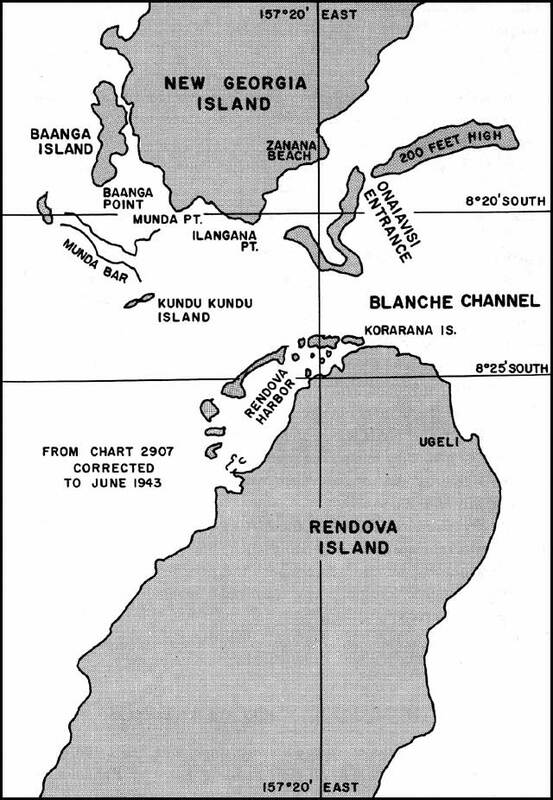 However, by 21 June it had been decided to use the Ugeli Attack Unit to seize both sides of Onaiavisi Entrance to Roviana Lagoon, since it was believed our unplanned for pre-D-Day landing on Segi Point at the eastern tip of New Georgia Island would lead the Japanese to build up their defenses along the coastline between Munda and Segi Point. This build-up would lead them to appreciate the importance of Onaiavisi Entrance for a landing on Zanana Beach, and to secure the islands guarding it. While paying much attention to New Georgia Island, the Japanese had paid scant attention to the island of Rendova during the six months prior to our landings there. On 30 June they had only about 150 troops, including a signal detachment and some engineers on this heavily wooded 20-mile long squash- shaped island. Some of these Japanese were manning lookout stations 8 to 12 miles from Rendova Harbor, but the majority formed a very surprised and ineffective reception party for the Army troops landing on Rendova. The Dent (APD-7) and the Waters (APD-9) were told off by CTF 31 as the Rendova Advance Unit, TU 31.1.2, for landing the first Army troops. These consisted of two jungle-trained and physically hardened companies of the 172nd Regiment, called Barracudas after the voracious pike-like fish dangerous to man. Our reconnaissance party, on Rendova Island since 16 June, was to make navigation easier for the two destroyer-transports and their landing craft by placing on Bau Island a white light, showing to seaward and marking Renard Entrance. Each of these destroyer-transports had on board not only two members of the very valuable Australian coast-watchers organization, but also Solomon Islanders, all presumably knowledgeable or qualified as pilots for the Rendova area. Despite all these assists, the Rendova Advance Unit managed to get started off on the wrong foot, and to stay on it. The Waters, scheduled to have troops on the beach by 0540, logged her landing craft as just leaving her side at a very tardy 0606, and the Dent logged an even later departure of troops at 0615. Neither ship logged the fact that their presumably highly knowledgeable pilots did not guide their Barracudas in the landing craft to the correct beach areas on the first try. The result of these nautical derelictions was that the specially trained Barracudas arrived at the specified assault beaches on Rendova Island after the regular troops from the large transports who were put ashore right on time and at the correct beaches. Since neither the Waters nor the Dent submitted an action report on their performance in TOENAILS, the cause of the delay in getting their landing craft away or how they missed the correct beaches by miles is unrecorded in the official records. An excuse, which would be hard to accept, would be "low visibility and rain squalls." to Rendova, where they arrived on 30 June, hove-to close to Renard Entrance, and started to unload about 0640. The transports McCawley and President Adams landed their troops at East Beach, and the President Hayes and President Jackson on West Beach. The cargo ships Algorab and Libra landed their troops and support on East Beach. The transport area was about one and a half miles from the prescribed landing beaches. Nearly perfect was main convoy ship to shore operation. During passage to Rendova, the eight destroyers assigned to Task Group 31.1 were in a circular anti-submarine, anti-aircraft defense screen around the six large transports and cargo ships which were in two columns of three ships each. Upon arrival at Rendova, the Gwin (DD-433), Woodworth (DD-460), Jenkins (DD-447) and Radford (DD-446) were placed in a Screening Unit and the other four destroyers in a Fire Support Unit, TU 31.2.1. About 0708, half an hour after the transports reached their unloading stations to the eastward of Renard Entrance to Rendova Harbor, the Japanese shore batteries on Kundu Kundu Island, south of Munda Point, opened fire on two destroyers of the Fire Support Unit of Buchanan (DD-484) and Farenholt (DD-491) and two destroyers of the Anti-Submarine Unit, Groin and Jenkins. These four ships were in the sea areas to the immediate west of the transports.
. . . there were six guns of 3" to 4.7" firing at this vessel. . . . 15 salvos were observed to be fired and as many splashes were observed close aboard. (50 to 300) yards. . . . A total of 223 rounds were fired in this first phase [by Buchanan]. The enemy appeared to fire an estimated 50 rounds. . . .
At 0832 one gun of Baanga Point opened up on the Buchanan again. . . .
At 1030 one shore battery on Baanga Point opened fire again using the Buchanan as target. . . .
At 1315 single gun in Munda Point Area opened fire. . . . Buchanan. . . . poured 64 rounds into the immediate area. No guns from any sector were heard thereafter. The Gwin was hit in the engine room by a 4.7 inch projectile during the early Japanese salvos at about 0710. The Farenholt and the Jenkins in the Anti-Submarine Unit reported near-misses. The Buchanan continued to offer herself as a target until the troops were all landed. 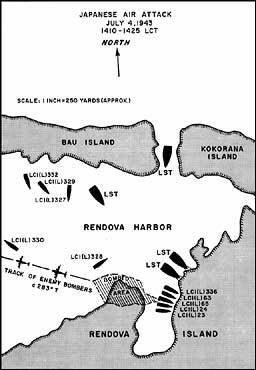 Since Kundu Kundu Island is about two and a half miles south of Munda Point and only six miles from Renard Entrance to Rendova Harbor, the local Japanese officer controlling the guns rendered a major assist to TF 31 when he disclosed the presence of his guns to the destroyers. The 4.7-inch guns were silenced without taking real advantage of a good opportunity to shoot at much larger and nearly stationary targets--the large transports and cargo ships hove-to unloading off Renard Entrance to Rendova Harbor. On D-Day, aircraft from TF 33 had three clashes with Japanese aircraft during which the defensive effort of these United States planes made a major contribution to the successful landing. During the eight hours covering the period from 0645 to 1445 on 30 June when the large transports were unloading troops and impedimenta in the Rendova area, the Japanese mounted only one ineffective air attack on the large transports. However, they did delay the unloading. Another rash of bogies showed up at 1103. The transports got underway and formed up with the destroyers commencing at 1112. Twenty-seven Japanese bombing planes and their fighter escorts were reported. Dog fights were visible from the transports. The air defense was perfect and no planes came close to the transports. By 1214 the amphibians were back unloading again. Only a little over one hour's time had been lost in unloading because of this first attack, partially due to the fact that the ships had not anchored to unload, but just hove-to. The Japanese aircraft did not return again until just after the large transports had completed their unloading chores about 1510 and headed for Guadalcanal. This time their attack was more damaging. They torpedoed the flagship of the Amphibious Force Commander, the McCawley, immobilized her, and left her a sitting duck for an unwitting coup de grace by our own PT boats. The third and last Japanese air attack of the day took place about 1715. During the early days of TOENAILS, CTF 33 sought to keep 32 fighter aircraft (VF) on station over Rendova between 0700 and 1630 daily.18 This was a real chore. 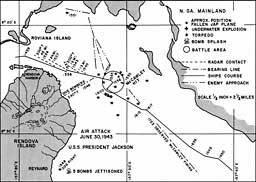 Rendova was about equidistant from the Japanese air bases in Bougainville and our own air base in the Russells, so the defensive problem in the air was far more difficult than that of an air attacker, who could choose his own moment to strike. CTF 33 had only a remote chance of massing a larger number of defensive aircraft over Rendova than the Japanese could bring to bear against him. Making the defensive problem of the naval aircraft even more difficult, in the five days prior to D-Day bad flying weather had reduced markedly the number of offensive flights from General MacArthur's Southwest Pacific Fifth Air Force. This command had the task of bombing the airfields at Rabaul and in the Bougainville-Shortlands Area prior to D-Day in order to reduce the number of Japanese aircraft available for attack in the New Georgia Group. On D-Day and D plus one the air cover missed intercepting the approaching Japanese aircraft several times, but generally only briefly. The amphibians fared well, losing only the McCawley. The big problem at Rendova on the first day--as it had been at Guadalcanal - was not the enemy. It was logistics. This time the transports got the logistic support out of their holds and onto the beaches in double quick time, but Mr. Rain and Mr. Mud were the overseers on the Lever Brothers' Plantation where the landing was made that day. They really fouled up the logistic support for the troops. 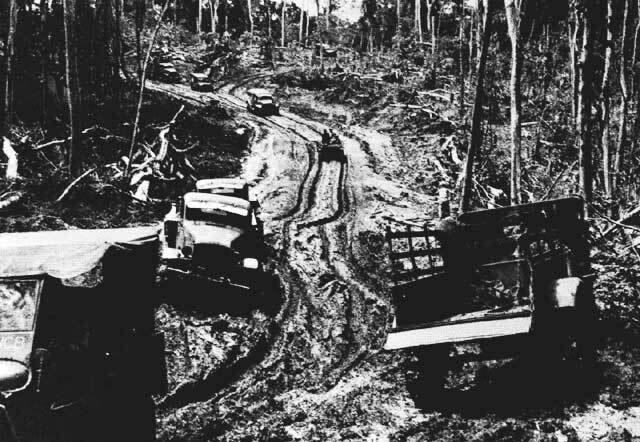 The heavy trucks and tanks soon were bogged down, and even hastily Seabee-built, coconut log roadbeds did not cure the logistical quagmire. By beefing up the unloading parties on each transport and cargo ship to 150 men--and by beefing up the Shore Party to 300 men--saving of time had been gained during the critical unloading period. While the large transports and their destroyer escorts were returning to Guadalcanal, the succeeding echelons of the Western Force were loading there and in the Russells. East beach [Rendova Harbor] was extremely unsatisfactory. The approach involved a very narrow, tortuous channel with a sharp, short turn to the beach behind Pago Pago Island. The beaching had to be made at dead slow speed and vessels were unable to plow their way through the mud to the beach proper. Vehicles could be operated only with difficulty because of deep mud and many had to be abandoned. . . . Besides the unmarked channels, the sharp turns required to miss coral heads and the mud just back of the beaches, the landing craft had to contend with the Japanese, who mounted a number of air attacks on the amphibians during the days ahead. 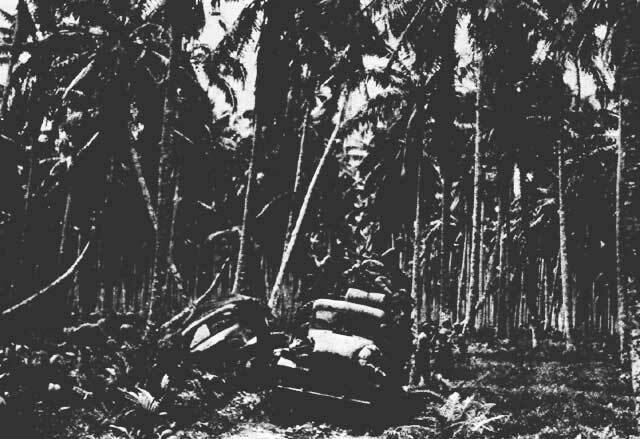 The 2nd Echelon beached at Poko Plantation, Rendova Island, about 0735 on July 1st. They learned years later that five Japanese destroyers on a mission to locate them during the night, had failed to push into Blanche Channel. By 1015 the LSTs and LCIs had been properly greeted by several small strafing waves of Japanese aircraft which did no important damage. 4 July 1943, Rendova Harbor. The 4th Echelon was not quite so fortunate as the 2nd. While it was enroute to Rendova, the LCI-66 and LCI-70 had a bow-on collision during execution of change of course, and there was the usual rash of bogies, which sent them to their guns. These amphibians beached about 0730 on the 4th of July. Before the 4th Echelon completed their unloading, sixteen Japanese bombing planes, in tight formation, swept low over the beached landing craft dropping their bombs. On Independence Day 1943, LCIs 23, 24 and 65 picked up their war wounds, but the landing ships and craft had the satisfaction of assisting in putting no less than ten Japanese aircraft to final rest. At about 1413, although no warning had been received over the only frequency we were guarding, 3000 KCs, it was seen that the guns of the two LSTs near us were being put on battery. Our guns were on battery and had been from before daylight so it was only necessary to warn the gun crews that there might be a condition red. General quarters was called and the ammunition passers and reloaders hurried to their stations, when some bombers were sighted. As the planes approached, they could be identified as Japanese, probably twin-engine heavy bombers of the Mitsubishi 96 type. The planes were in a tight U, flying at from 2500 feet to 3000 feet. Staff Sergeant Biggerstaff, correspondent of the News Service Division of the Marine Corps, who had just come aboard for passage to the Russell Islands, agrees about the height of the planes. They were coming almost out of the sun which bore about 115°. T. The planes were coming directly at us a little off our starboard bow. They dropped a few bombs, which as far as we could tell did little damage, most of them striking harmlessly in the water. The guns on the USS APc-24 opened fire when the planes were at a range of about 4000 feet. The planes approached in our direction and passed almost overhead. Our guns, four 20 MM Oerlikons and two 50 caliber Browning Navy type machine guns fired steadily at the planes and tracers could be seen hitting squarely in the fuselage, wings and tail assembly. Some of the tracers from the 50 caliber could be seen passing through the wings. The lead ship in the formation which took the fire from three 20 MM machine guns and one 50 caliber machine gun was fatally hit by our guns. The plane burst into flames near the right engine, the tail assembly and main fuselage were blown off by an explosion, and the wings and forward cockpit with one side flaming fluttered like a leaf down toward us. Our gunners, in the meantime, shifted their attention to the second plane from the outside on the left of the U. Our other 20 MM and 50 caliber machine guns had been concentrating their fire on this plane and had it already limping when the additional fire was turned toward it. One motor was smoking. With all six guns riddling it back and forth, the plane suddenly exploded and fell in many blazing pieces into the harbor. In the meantime, the first plane we hit fell into the water about two or three hundred yards astern of us. By then it was impossible to direct the guns to fire at any individual plane. Our tracers could be seen going into several other planes and undoubtedly they assisted in the destruction of some more of the enemy bombers. By this time planes were falling so fast it was hard to keep track of them. A number of the enemy bombers fell in the direction of Bau Island and Pau Island. Some seemed to fall in the direction of the northeastern corner of Bau Island or in the sea on the other side. It was impossible, in the short period of the action to count the number of bombers that fell. We believe we saw nine, but it may have been more. Only three out of the original sixteen returned in a tight formation and passed to the south of us out of range. Although out of range by then of anything but 40 MM and 90 MM, all ships in the harbor fired in their direction. We saw no other signs of the sixteen, and as there were so many being knocked out of the air, we figured on a possible thirteen of sixteen planes knocked down. It is my personal opinion and the opinion of my other officers, and the Marine Correspondent Staff Sergeant Biggerstaff, that all of the planes knocked down were hit by the fire of various Landing Craft Flotilla vessels in the harbor. As far as we could determine, the shore batteries were not responsible for the downing of one plane. This vessel ceased firing at 1425. The surprising thing was the tight formation and low altitude the Japanese were using. It was as if they expected no opposition from anti-aircraft fire. Even though planes were being knocked out of their tight formation they held right on with it until they themselves were knocked out of the air. Between building a temporary caisson needed to make possible replacement of a lost propeller on the LCI-223 and firing their guns in anger for the first time, the LCI amphibians of the 4th Echelon had a busy and glorious Fourth of July. Unloading parties of 150 men on each LST, 50 men on each LCT and 25 men for each LCI absorbed a lot of men but numbers worked marvels in getting cargo out of the ships onto the beaches and then inland to the supply dumps, and speeded the amphibians away to calmer areas. The story of the Western Force would not be complete without detailing the major happenings of the return to base of the large transports and cargo ships. As has been mentioned before, the amphibian ships at Rendova had only two welcome hours to land their troops and equipment before radar contacts with an unidentified aircraft about 0900 on 30 June sent the crews hurrying to their anti-aircraft batteries, and the ships scurrying to their positions in a protective anti-aircraft cruising disposition. An actual attack did not develop, nor did actual bombing of the transports develop from a further radar alert about 1100, but in each case there was a period of about an hour of cruising about near the transport area when no unloading could be accomplished. After these two interruptions, and having smartly completed the lion's share of their unloading and established new records of tons per hour winched out of their holds, the transports and cargo ships were underway in an anti- aircraft defensive formation about 1510 to withdraw to base. There were eight destroyers in the circular screen, the six large amphibians being in division columns abreast. Shortly after 1545, there commenced a large scale "do or die" Japanese torpedo bombing attack on the formation, which washed out a fair share of the office files of the Commander Amphibious Force Third Fleet on the McCawley and about 20 of the 23 attacking planes. The McCawley was torpedoed about 1553 when in Blanche Channel about 12 miles east by south from Rendova Harbor. At that time, she was steaming at 14 knots and was the lead ship in the left-hand column with the President Hayes and the President Jackson astern. There was a rabbit's foot in the pocket of the Captain of the escorting Farenholt. The torpedo which hit the destroyer was a dud. An hour and a quarter later, with the McCawley making heavy weather from her hit, her port engine room flooded and the rudder still jammed hard right, and while being taken under tow by the Libra (AK-53), the Japanese came back with eight dive bombers and some fighter escorts. They scored no hits on their wounded victim nor on the two escorting destroyers nor on the Libra. In the WATCHTOWER Operation the large transport George F. Elliott (AP-13) had been sunk off Guadalcanal. The South Pacific amphibians were about to offer their TOENAILS sacrifice, and this time it was to be their flagship. Japanese Air Attack, 30 June 1943. For the Rendova landings of TOENAILS, the McCawley, Commander Robert H. Rodgers (1923), commanding, carried 1,100 troops and 604 tons of equipment as well as the senior Army and Navy commanders in the Amphibious Force and their staffs. After the completion of the unloading which was accomplished by the McCawley in record-breaking time, the task force got underway and proceeded for Guadalcanal. While entering Blanche Channel Task Force 31.1 was attacked by about twenty-three Mitsubishi '01' torpedo bombers. The Task Force had just executed a ninety degree turn to the right and opened fire when a torpedo was seen approaching McCawley's port side on a collision course. The rudder was put hard right. . . . This torpedo hit [at 1553] port side amidships in the engine room spaces, track angle about one hundred ninety degrees [one hundred and eighty would be from dead stern]. McCawley took a violent port list, but righting immediately still swinging right with rudder jammed hard over, all engines stopped, ship having lost all power. Two torpedoes then passed down the starboard side very close aboard, track angle one hundred eighty degrees. The attack ended with all enemy planes shot down by AA fire of Task Force 31.1, McCawley claiming four planes. Rear Admiral Turner ordered the USS Lihra (AK-53) to take McCawley in tow and Ralph Talbot (DD-390) and McCalla (DD-488) to stand by to assist. Admiral Turner and staff then at (1625) shifted to the USS Farenholt (DD-491) and proceeded with remainder of Task Force, leaving Rear Admiral Wilkinson in McCawley as OTC [Officer in Tactical Command] of salvage group. At 1640, upon orders of Admiral Turner, Ralph Talbot came alongside and removed all personnel from McCawley except for a salvage crew. [at 1717] McCawley was heavily strafed by attacking planes. If requisitioned damage control material had been delivered, damage control might have been accomplished. However, due to low priority, delay up to 18 months has been experienced. Full realization that attack transports are combat ships and they should be so classified. At 1900 I concluded that the chances of McCawley surviving the night were slim, that I would remove the remaining personnel, but that I would tow until she actually sank. . . . Unfortunately the Pawnee lost the tow at 2000. . . . At 2021 the McCawley was struck by two torpedoes. . . . She was seen to sink by the stern shortly thereafter. The source of the torpedoes was not seen, but within a few seconds after McCawley was struck, two torpedo wakes were seen approaching McCalla. By turning to parallel, both torpedoes were avoided, one passing ahead, one astern. In these days when every naval craft larger than a rowboat seems to have one or more radars, it is perhaps well to record that eighteen months after the United States entered World War II that the McCawley was the only transport equipped with radar and when she was sunk, the large transports necessarily depended upon the destroyers for their radar information. At 2014 PT 153's radar detected a very large target distance 800 yards surrounded by eight smaller targets, apparently landing craft. The first section closed range to about 600 yards. Targets appeared to be a large destroyer, a 7000-10,000 ton transport and a small destroyer or transport. [They] were seen to have converged. The large transport was lying to, and the other ships were slowly circling behind it. At 2016, PT 153 fired four torpedoes at the transport and radioed for all boats in the first and second sections to press home the attack. PT 153 continued on same course and at same speed to allow other boats to fire undetected. When PT 153 was 300-400 yards from the transport, four torpedoes were seen to strike it in succession; one forward, two amidships and one aft. PT 153 then reversed course to the left and retired at slow speed. The first two torpedoes hit seconds apart; the last two simultaneously. . . .
PT 118 on the starboard quarter of PT 153 fired two torpedoes at a small transport or destroyer and observed two direct hits. As the PT 118 retired following PT 153, her target appeared to be sinking by the stern. Fortunately for the United States Navy, the motor torpedo boats of Torpedo Boat Squadron Nine were poor shots, and they did not cause the carnage amongst the amphibious ships and escorts of the Third Fleet which they so earnestly, unwisely, and unskillfully attempted. To get the Brass [his staff] and himself to a ship where he could continue to command the Assault Force. I put his LCVP barge in the water, and ten minutes after the torpedo hit, they were being transferred. Despite the loss of the amphibious flagship, and despite the logistical difficulties, the major mission of the Western Force had been accomplished. The Landing Force Commander, his initial echelon of troops and their impedimenta had been established ashore on D-Day. They were pretty wet and a bit unhappy about the rain and the mud, but they were where they had asked to be put. The basic CTF 31 Op Order A9-31 contemplated the Eastern Group putting ashore about 7,700 troops from the first four echelons of amphibious movements at three widely separated landing beaches: Viru Harbor, Segi Point and Wickham Anchorage. Rear Admiral Fort retained direct command of the Wickham Occupation Group, and flew his flag in the destroyer-type minesweeper Trever. He withdrew his two senior subordinates from their normal assignments and placed one of them in command of the task units carrying troops to Viru Harbor and the other in command of the follow-up landing at Segi Point. His Chief of Staff, Captain Benton W. Decker (1920), commanded the Segi Occupation Group and Commander Stanley L. Leith (1923), Commander Minesweeper Group, drew the more interesting Viru Harbor assignment. No one of these three task units polished off its operational tasks exactly "according to plan." Their trials, tribulations and eventual success will be related in some detail in the following pages. 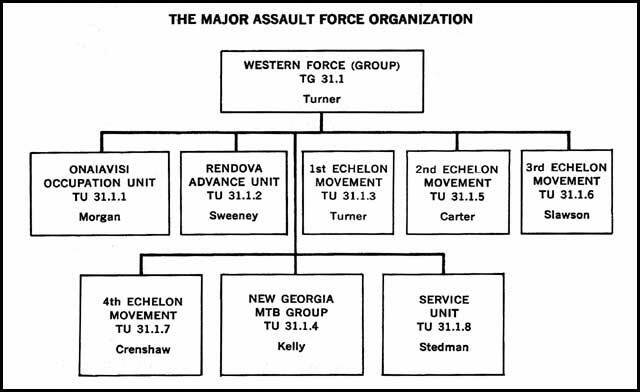 1 APc and 2 LCTs combined and sailed with the 3rd ECHELON, and are listed in (4) above. The LCT-129 lost her ramp, but did not founder. TOENAILS was the first major operation in the South Pacific in which the small coastal transport, the APc, participated. These small and slow wooden-hulled craft were 103 feet long, displaced 258 tons, and made 10 knots with a fair breeze at their sterns. The commander of the small task unit assigned to the seizure and occupation of landlocked Viru Harbor on the southern side of New Georgia Island had the difficult chore of joining an overland movement with a sea movement at the scene of battle at a given hour of a given day. The original assault plan was modified after the Marines from the 4th Marine Raider Battalion moved into Segi, ten air miles to the east of Viru Harbor, on 21 June 1943. This was done in an effort to take advantage of the Marines' position ashore and on the flank of Viru Harbor. seen, Commander Viru Harbor Occupation Group was to start the troops from the 103rd Infantry toward their landing beach. Information in detail about Viru Harbor was scarce, and available charts of the area were a bit sketchy and inaccurate in some details. This inaccuracy is illustrated by the difference between the upper and lower charts on the next page. The top one is taken from pre-invasion charts and the lower one from post-invasion maps. However, there were some fine aerial photographs taken during the preparatory periods. These indicated that the small pier in Viru Harbor near which it was hoped to land the Army troops, could not be seen during a seaward approach until ships were right at the harbor entrance. 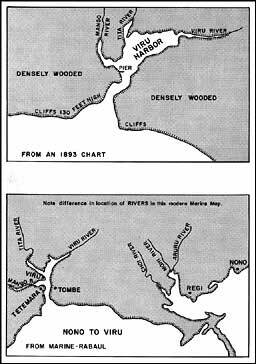 This was true (1) because thousands of trees lined the high cliffs on either side of the harbor entrance, and (2) the 300-yard wide coral-studded channel veered steadily to the right for the better part of a mile before opening into the long narrow harbor. On the western side of the harbor entrance, near Tetemara, the Japanese had mounted a 3-inch naval gun to protect the harbor approaches, together with four 80-millimeter anti-aircraft guns to protect the naval gun against air attack. A late change of orders from CTG 31.3 directed the Marine Advance Unit to move from Segi westward during the night of 27 June, instead of 28 June, and to land at Regi, two miles nearer to Viru than Nono. This not only provided 24 additional hours for the Marines to get into position but shortened the overland march to less than seven miles by the map. Above: Viru Harbor in 1893. Below: Viru Harbor in 1943. In any case, the enemy ceased fire, and the ships did likewise as they moved out of range. The Japanese major commanding at Viru reported to his seniors at Munda that a landing attack had been repulsed, and in fact it had been. addition there were mangrove swamps to overcome just outside of Regi and again on the far side of the Mango River. By great perseverance the Marines made it only a day late and captured the 3-inch naval gun guarding Viru Harbor, in mid-afternoon of 1 July. Despite a CTF 31 operational priority despatch to hold the 2nd Echelon of the Viru Occupation Force at the Russells until informed that Viru Harbor had been captured, the heavy radio traffic of 30 June prevented the message getting through in time. This mighty force of one APc and four LCTs chugged along unaware that the port was still in enemy hands. 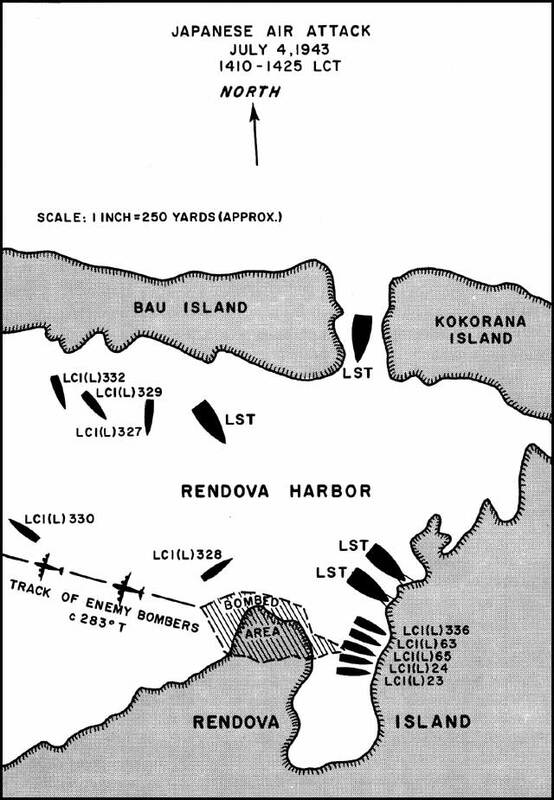 The LCTs in the 2nd Echelon for Viru Harbor arrived off the harbor entrance on schedule on 1 July, witnessed one mid-morning six plane air attack on Japanese-held Tetemara, then proceeded to land their supplies as soon as the Marine attack ended, with the surviving Japanese escaping toward Munda. The Hopkins after completing its chores, picked up the Marine wounded and sped them back to the Russells. Viru Harbor was indicative of what happened to operational time tables when land movements through the densely wooded areas of New Georgia were involved. ship's logs indicated the Army troops were disembarked at Segi Point on D-Day. The original plan for the establishment of a PT boat base at Viru Harbor was abandoned because the harbor was found unsuitable. The best dividend out of the occupation of Viru Harbor came from a small marine railway at Viru, built by the Seabees. It was useful in repairing the PT boats which all too frequently grounded in the months ahead while boiling along at high speed in poorly charted waters. Segi had been much in the planners' eyes. In the first place the planners knew something about the area because Segi home-ported a plantation and a coast-watcher. Reconnaissance patrols were frequently landed there. Very early planning at the SOPAC level had visualized landing the main body of troops for the flank assault on Munda at Segi and moving them through the dense woods to make the attack. Second thoughts proved better. 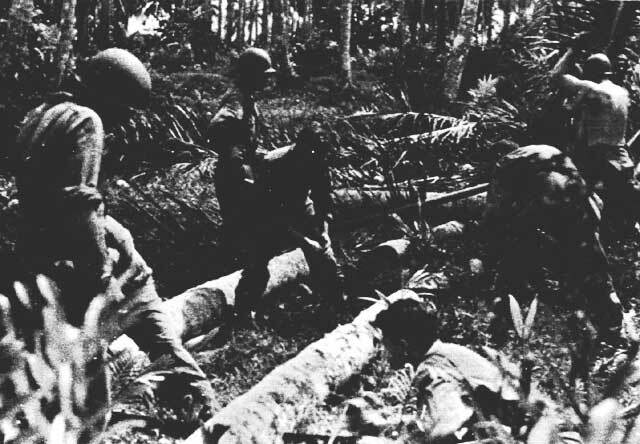 Marine troubles in getting two companies from Segi to Viru Harbor on 27, 28, 29, 30 June were harbingers of future difficulties when Marines and Army troops would attempt to move through the dense woods against Japanese-held positions around Munda air base. 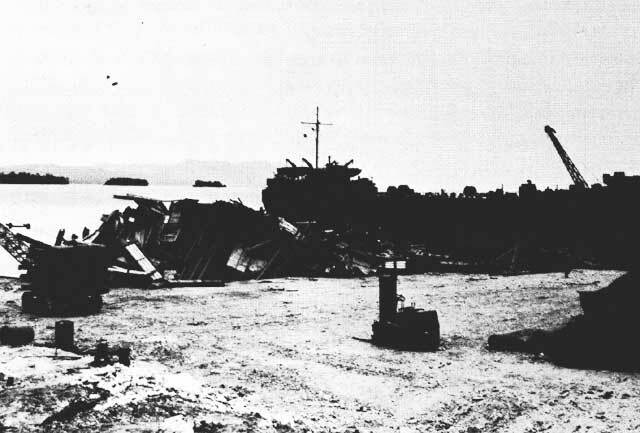 Since Segi Point and its immediate surroundings had been taken by the Marines on 21 June, there was no problem for Commander Segi Occupation Group beyond piloting his 1st Echelon ships and craft, through largely unmarked channels to a specific beach area on a dark, rainy and windy night, and moving the troops into the boats and ashore in the choppy seas. The problems of all the landing ships and craft are illustrated by the recorded experience of APc-27, which led the 2nd Echelon into Segi Point. 1 July 0030. In order to notify LCTs astern of change in convoy speed to five knots, swung out of lead position and notified first LCTs in column astern. Proceeded approximately one mile astern of these first three LCTs to notify the fourth which was straggling. 0946. Ran aground on reef in Panga Bay, said reef not charted on secret chart prepared from various sources for use in invasion operation. Unable to work free under own power. 1123. Came off reef with no apparent damage to ship. APc-27 was not the only landing ship which unintentionally ran aground during TOENAILS. The LCT-322 in the 4th Echelon for Segi grounded on 3 July and was pulled off by the tug Rail on 4 July. Segi paid far more real and speedy dividends than either of the other diversionary assaults made by the Eastern Force on 30 June. Beginning 10 July, it was possible to provide fighter support for all bombing missions against Munda from the Seabee-built 3,300-foot long Segi airstrip. By 15 July, when Rear Admiral Turner reluctantly took his departure from TOENAILS, our aircraft from Segi were providing daylight protection to amphibious craft during the last lap of their passage from the Russells or Guadalcanal and at the beachheads. Early in the planning stages of TOENAILS, it was hoped that an airstrip might be built on Vangunu Island to provide fighter and close air support for later phases of operations in the Middle Solomons. When actual reconnaissance indicated there were no really good airstrip sites available, Vangunu Island stayed in the plans because Wickham Anchorage off Oleana Bay on the southeast coast, two-thirds of the way from the Russells to Rendova, looked like a good place for the landing craft to bide-a-wee should they encounter very heavy weather or have engine failure beyond the capacity of their limited engineers' force to repair. At Wickham Anchorage landing craft could remain during the daytime and be given anti-aircraft protection. 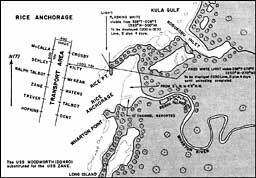 The fact that the Japanese had a company and a half of troops in the vicinity of Vuru, a mile south of Wickham Anchorage, led to beefing up the Landing Force but did not change the basic intention. Vangunu Island and Wickham Anchorage. the Wickham Anchorage Occupation Group, by far the largest of the three task organizations of the Eastern Task Force. His flagship was the destroyer-type minesweeper Trever (DMS-16), chosen because presumably she had a good surface radar, a scarce commodity in June 1943. There were two companies of Marines, a battalion of Army troops, a battery of 90-millimeter anti-aircraft guns, part of a battery of 40-millimeter and 50-caliber antiaircraft guns, as well as the Seabees and naval base units to be landed. Two destroyer-type transports were available to land the Marines. 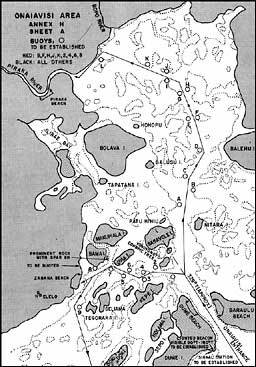 The Scheme of Maneuver called for the destroyer transports to put the Marines ashore during darkness at Oleana Bay three miles to the south south-westward of Wickham Anchorage, and for the Marines to march overland to make a daylight attack on the Japanese troops, reportedly numbering about 100 at Vuru. The Army troops, landing from seven LCIs, would follow close behind. Vuru unfortunately lay between Oleana Bay where there was a good 500- yard-wide sandy beach which was not patrolled by the Japanese and Wickham Anchorage where the staging area base was to be established. Wickham Anchorage had only a narrow beach which was patrolled by the Japanese. While a night landing was planned for, the plans did not contemplate the miserable weather encountered. Commander Eastern Force submitted no action report on this operation, nor did the Trever, McKean nor Schley. None of the ships kept a war diary and the McKean never even bothered to write up the Ship's Log for the morning watch on the eventful morning of June 30th, when the landings took place. The Schley did the best writing job of all and her Ship's Log records the following items which tell the highlights of the sad story of what happened after the Trever, Schley and McKean hove-to at about 0230, hopefully off of Oleana Bay. 0256. Heavy seas running, making embarkation of Marines extremely difficult. 0303. Sighted light on beach. 0316. Launched all boats. * * * * * 0434. Landing made at wrong beach--about 6000 yards northwest of western end of Oleana Bay. 0435. Commenced steering various courses and speeds proceeding to Oleana Bay. Boat #3 and LCV following ship; unable to contact other boats. * * * * * 0701. Boat #2 returned to ship with officers and crews of boats #1 and #4, and crews from two McKean boats. Ensign Rodner reported that boats #1 and #4 hopelessly beached on wrong beach. Marines landed. 0731. Sighted four boats high and dry on beach about 6500 yards west of Oleana Bay. Recovery of boats not deemed feasible due to rough seas, daylight and proximity of enemy forces. 0745. Returned to Oleana Bay. Resumed disembarking Marines. 0808. All Marines off ship. The McKean Log indicates that at 0325 she began disembarking troops. There are no entries for her 0400 to 0800 watch. At 1000 it is logged that all her Marines were landed. The Trever logged all her Marines landed by 0925. Commander Task Group 31.3 and CTU 31.3.31 (Rear Admiral Fort) logged his arrival at 0230 and added (despite the contrary fact) 'did not land troops.' The troop landing was logged at 0630. Putting together the pieces of evidence, it is apparent that those who read the radar screen on the Trever that night did not recognize Oleana Bay so the flagship and the two following APD's hove-to some three miles to the westward of the bay. Some of the landing boats shoved off in a downpour of rain. Darkness and choppy seas complicated the coxswain's tasks. The boats landed well to the westward of the chosen beach areas. The markers on the beach were some three miles to the eastward, so they could not be seen from shipboard. The seven LCIs were scheduled to land their Army troops thirty minutes after the Marines went ashore. This brought the LCIs steaming through the area where the Trever and the two APD's were hove-to since the LCIs were proceeding far more expertly than the larger ships to the correct debarkation area. There was much confusion, but by skillful seamanship, no collisions. As detailed before, while the Rendova and Onaiavisi Entrance landings were smartly accomplished and Segi Point was little more than a training exercise in difficult piloting, on 30 June the other minor occupations were having problems. 0145 on 3 July, the Japanese light cruiser Yubari and nine destroyers swept down to the western approaches of Blanche Channel and carried out a bombardment of Rendova Harbor and the beach areas. There was negative damage to the logistic support ships still resting there. A radar-equipped night flying patrol aircraft called a "Black Cat" made contact with the Japanese task force and dropped a bomb on it without results, except probably to add to their worry factor. To bolster the Munda defenders the Japanese immediately moved about 3,000 troops from Kolombangara to Munda. Additional troops from the Northern Solomons were moved to Kolombangara and thence to Munda by almost nightly small barge movements. On 9, 11, and 12 July, another large group of 5,700 Japanese troops from the 13th Regiment were moved from Kolombangara to Bairoko and were added to those defending the Munda area. All this troop reinforcement was accomplished despite Allied knowledge of many of the impending Japanese movements and offensive forays by our cruiser-destroyer forces into Kula Gulf on 5-6 July and 12-13 July. Patrols moved from the islands astride Onaiavisi Entrance to Zanana Beach on 30 June and 1 July. During the night of 2 July the first large contingent, a battalion of the 43rd Division, was embarked by the amphibians at Rendova and landed at Zanana Beach. Landing craft which towed troop-loaded rubber boats behind did the chore. At Onaiavisi Entrance native guides in canoes took position at the head of columns of landing craft and piloted the lead craft around the numerous shoals and small islands to the beach. The problem of getting from Onaiavisi Entrance to Zanana Beach as it appeared prior to the actual landings is illustrated by the accompanying chart. Onaivisi Entrance and approach to Zanana Beach, New Georgia Island. By dark of 5 July, two regiments of troops were ashore on the south coast of New Georgia Island, five miles from the Munda airfield. During the night the Northern Landing Group went ashore at Rice Anchorage, on the northwest coast of New Georgia Island 15 miles north of the Munda airfield. By 9 July, the shuttling amphibians had disembarked a fair share of another division of Army troops, the 37th Division, in the Rendova area. Early on that day our destroyers poured nearly 2,500 5-inch shells on Japanese-held positions at Munda in a total gun effort of some 5,800 rounds for that morning. Nearly a hundred planes also dropped bombs on enemy defenses around Munda airfield. All this was done without opening for the troops an easy path through the jungle, that was a combination of jungle, swamps and steep ridges, defended by well chosen strong points manned by Japanese willing to die. By 11 July, Major General Hester had decided to use Laiana Beach, where early plans had called for landing, in lieu of Zanana Beach, three miles to the westward. By 19 July, Laiana Beach was secured and the amphibians landed Marine tanks and Army troops there. Mid-June plans had called for a July Fourth amphibious landing at Rice Anchorage, 15 miles north of Munda Point, and on the New Georgia side of Kula Gulf. The actual landing was delayed until July 5th due to a necessary troop unit shift. The 4th Marine Raider Battalion lost the assignment, having been delayed by the time required to secure Viru Harbor, and was replaced by the 3rd Battalion 145th Infantry. The tasks of the Landing Force of the Northern Landing Group were (1) to close the back door to Munda and prevent its reinforcement from Kolombangara Island by seizing Enogai Inlet and Bairoko Harbor and (2) to prevent the escape of the Munda garrison when it was placed under heavy attack from the flank and front. Rice Anchorage was chosen rather than Enogai Inlet or Bairoko Harbor because Japanese troops at these two ports were closer to Munda, and hence easier to support or reinforce. By and large, the purposes of the landing were not accomplished, since reinforcements from Kolombangara were continuous until the last days of the siege of Munda. When that flow ended, the Munda defenders slithered out to the west to little Baanga island and then on to big Arundel Island, and from thence the 1,200 yards to Kolombangara. Rice Anchorage on the northwest coast of New Georgia Island. destroyers. The Woodworth (DD-460) substituted for the damaged Zane (DMS-14). None of the destroyer transports or destroyer minesweepers was fitted with an SG (surface) radar, but the three destroyers in the formation would make up for the deficiency. The radar of the Ralph Talbot identified Rice Point and Wharton Point and coached the formation to the Transport Area, where they hove-to about 0125. About 0130 on 5 July, in a driving rainstorm the amphibians immediately launched all boats and began embarking the Marines and Army troops. The lights on the beach, as shown on the accompanying chart, were not due to be turned on until 0200, so the coxswains did not even have these feeble aids to assist them in the heavy rain when the first boats left for the beach at 0145. In the hurry to unload the transports, some of the ships overloaded their landing boats with the result that the landing boats could not clear the reef blocking the entrance to Wharton River. These boats had to return to their transports to lighten their loads and make a second try. It was a case of "haste makes waste." One amphibian landed its Army company to the nlrth of Rice Point and failed to correct the error which became known before departure. Coxswains reported a large group of native New Georgians as a welcoming party on the beach and much confusion off the beach as boats maneuvered for the best position to land next. Soon after arrival in the Transport Area the amphibians were surprised to be illuminated by star shell and to come under fire from coastal defense guns in the Enogai Area. While Japanese guns were known to protect Bairoko Harbor, no such guns had been reported by the natives supposedly familiar with the Japanese defenses in the Enogai Area. The transports were ordered not to return this fire but to leave this chore to the two destroyer escorts, and to concentrate on disembarkation of the troops and their impedimenta. As ships completed their unloading tasks, they cleared the anchorage area. The Radford and the Gwin expended some 1,100 rounds of counter-battery fire, but since they had only the flashes of the Japanese guns as a point of aim, the Japanese batteries were still shooting at 0559--dawn--when Commander Transports, unloading having been reported completed about 0555, directed the last of the ships underway to return to base. After their capture five days later, it was determined the Japanese guns were four 5.5-inch guns. It was discovered much sooner that one APD had failed to unload an essential radio transmitter belonging to the 3rd Battalion of the 145th Infantry of the 37th Division and that the Trever had two Army officers and 64 men left aboard out of seven Army officers and 209 men embarked. On 12 July three fast transports of Transport Division 22 (Kilty, Crosby and Schley) with the destroyers Woodworth and Taylor as screen, returned to Rice Anchorage with further troop and logistic support. Unloading commenced about 0120 and was stopped about 0430 because of a firm desire to be under our air cover by daylight. 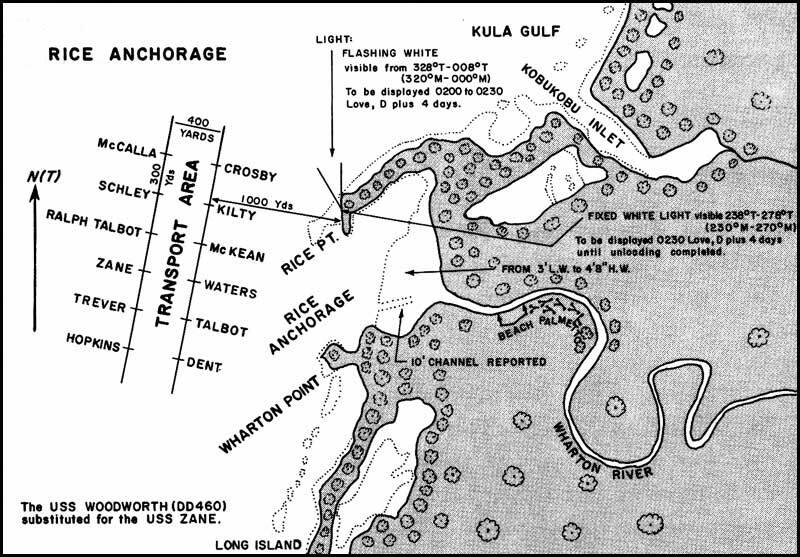 Only a partial unloading job was done under difficult but somewhat less difficult circumstances than the first amphibious landing at Rice Anchorage. The last newsworthy act of the TOENAILS Operation in which Rear Admiral Turner personally participated was in connection with the relief of Major General John H. Hester, U.S. Army, from his prospective command of the New Georgia Occupation Force. In order to detail Rear Admiral Turner's advisory part in this difficult decision taken by Vice Admiral Halsey, a bit of background is essential. In the Turner personal files, there are seven despatches bearing on the matter and that is all. In the PHIBFORTHIRDFLT files, no reference to the matter could be located. As far back as 13 June 1943, Admiral Nimitz had proposed to Admiral King that Rear Admiral Turner be relieved by Rear Admiral Wilkinson "after completion first stage New Georgia Operation," and be ordered to command the Amphibious Forces, Central Pacific and the Fifth Amphibious Force being formed up for the Central Pacific campaign. In the planners' "future book," the first stage of the New Georgia operations was the capture of Munda, anticipated to be completed about mid- July 1943.
at the earliest possible time," for the development and integration of amphibious plans, under Vice Admiral Spruance's command for the Central Pacific Operations58 Vice Admiral Halsey and Rear Admiral Turner were thus alerted that desires existed at higher levels of command for Turner's presence at Pearl Harbor at an early date. The Japanese defense of the Munda airfield approaches had been spirited. The attacks by the troops of the 43rd Division which Major General Hester commanded had not been sufficiently spirited to overcome Japanese resistance. When the troop offensive ashore on New Georgia gave its first evidence of slowing down, calls were made by Major General Hester for additional troops. As early as 5 July, Rear Admiral Turner was in conference on Guadalcanal with Major General Griswold and Lieutenant General Harmon in connection with moving forward part of the 37th Division, which was sailed for Rendova on the 7th and 9th of July. Each of these four officers was directly involved in the current phase of TOENAILS as well as in planning and preparation for the assault landing on Kolombangara, and the capture of the Vila airfield which were planned to follow soon after the capture of Munda. On this same day, 5 July, Lieutenant General Harmon recommended to Commander Third Fleet that as soon as Munda airfield was captured, the XIV Corps Commander, Major General Griswold, should take over command of the New Georgia Occupation Force, and that Major General Hester continue in command of the 43rd Division and conduct the attack on Vila. Rear Admiral Turner immediately put in his oar backing up Major General Hester, saying that superseding Hester would be undesirable and "a severe blow to morale." He expressed his regret at having to disagree with Lieutenant General Harmon. At the same time he sent Colonel Linscott, who in the forward operational area and in the absence of Captain Anderson, was an "acting Chief of Staff," to Rendova and New Georgia to look into what the amphibians could do to ease the difficulties the Army troops were encountering in taking Munda airfield, as well as to move forward with the planning for taking Vila airfield. There is no radio message available in which Major General Hester reported to COMSOPAC that he was ready to take over command of the New Georgia Occupation Force, and no despatch to COMSOPAC from CTF 31 suggesting that from his point of view such a moment had arrived. The ground rules for the appropriate circumstances when either commander would originate such a despatch had not been established by their common superior, Vice Admiral Halsey. This again accentuates the incompleteness of this part of the over-all Operation Plan 14-43 issued by Vice Admiral Halsey. By 8 July the original plan for a combined assault on Munda airfield from the sea and from the flank, which earlier had been postponed, was now abandoned since the troops of the 43rd Division had not reached their jump- off positions by 8 July, and there appeared no real prospect of this happening soon. When word of this postponement decision by Major General Hester reached Guadalcanal, Lieutenant General Harmon flew off to Noumea and a conference with Vice Admiral Halsey. I regret that I am compelled to agree with Griswold. From my own private advices received today from my staff officers returning from Rendova. . . . The Navy had been much condemned for its inadequacies in logistic support during the first months of WATCHTOWER. Unlike the Guadalcanal Operation, there were 1st, 2nd, 3rd and 4th Echelon logistic support movements set up for the TOENAILS Operation and a dozen support echelons had sailed in the first 15 days of TOENAILS. Enemy action, groundings and modified plans had forced many changes in the ships and landing craft originally designated for specific supporting echelon tasks. The important lesson from all this was that in order for logistic support to be delivered by amphibious ships and craft on time, a large excess of ships and craft is required over the computed space requirements for the total of personnel and tons of equipment to be moved. The personal worry bug to be overcome by every amphibian, coxswain, officer in charge or commanding officer was the coral shelf and the many coral heads off the few and generally narrow beaches. In due time, these coral heads would be dynamited. The beaches would be augmented with landing piers, which would be coconut log bulkheads backed up by crushed coral. But the first few days in poorly or uncharted waters were real tests. When the first surge of TOENAILS was over, it was apparent from the reports that both landing ships and craft had turned in better than a satisfactory performance. The LCTs had been the most useful of all types. However, low speed (6 knots) limits their daily staging in combat areas to about 100 miles per night. It is still advisable to have them underway only at night. . . . Against a head sea, their speed is greatly reduced, sometimes to two knots. . . . The crews and officers have been standing up well in spite of operating two out of every three days. Some LSTs have transported 400 men each for short periods. . . . [LCTs] have carried as many as 250 men overnight, but in exposed positions. . . . The LCIs carry about 170 combat troops. . . . For unopposed short runs of a few hours, 350 men have been transported on a single LCI. . . . They are ideal for night landings on good beaches. The APc's, besides having proved useful as escorts, have been used to transport small groups of men. . . .
Night landings on foreign shores look very well on paper and over the long history of amphibious operations have been resorted to many times. Our Navy had carried out such operations on a large scale in the North African Invasion on 8 November 1942. The Sicilian Invasion commencing 10 July 1943, eleven days after D-Day for TOENAILS was to include a large successful night landing of the assault troops. Rear Admiral Turner took a dim view of night landings prior to TOENAILS but had not closed his mind to their use. He was willing to experiment on a small scale. So the Eastern Force scheduled a night landing at Wickham Anchorage and the Western Force scheduled night landings for the Onaiavisi Entrance Unit and for the Advance Unit on Rendova. In this connection, frequently the question has been raised as to why the major World War II amphibious assault landings in the South and Central Pacific were launched at daylight while those in the European Theater were largely launched during darkness. It may be that the answer lies in the above observation of Admiral Turner and in the writings of Sir Roger Keyes. He was the Chief of Staff to the naval commander at the Gallipoli amphibious landing disaster in 1915. He later became an Admiral of the Fleet in the British Navy, and before and after retirement wrote extensively. His opinion was that it was "folly to storm a defended beach in daylight." 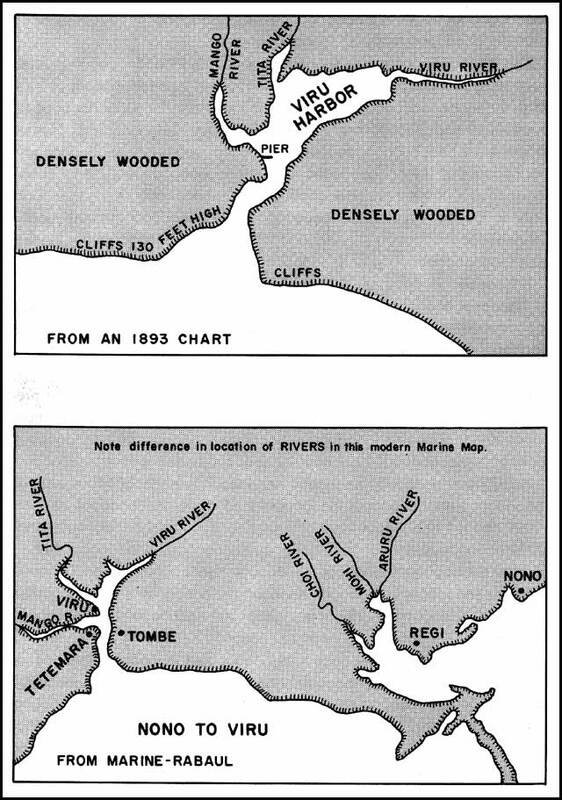 A good many United States naval officers had read and been impressed by what Sir Roger Keyes wrote. In a measure, the opinion of General Vandegrift previously quoted, supports this conclusion. In the Mediterranean, where the British influence and command lines were strong, the principle of night landings was observed during the North African, Tunisian, Sicilian and Italian campaigns. In the South Pacific there were jungle bordered beaches (with no access roads) to contend with. 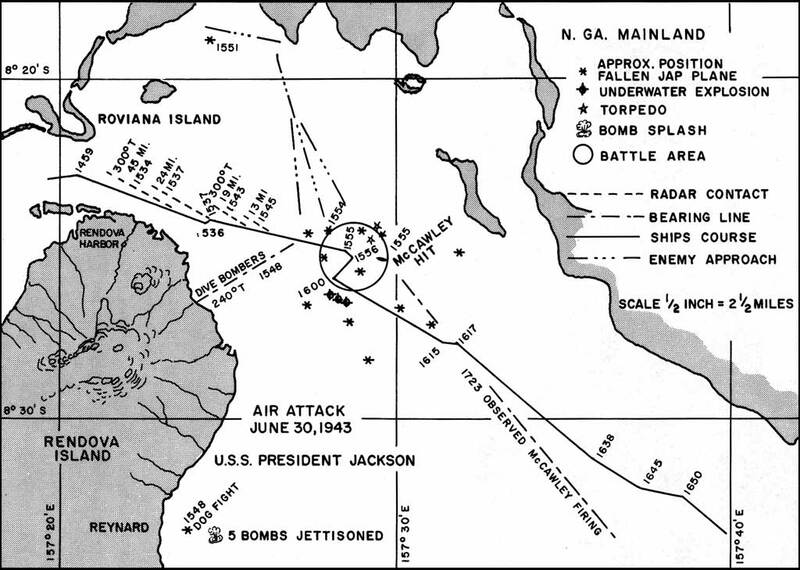 In the Central Pacific there was a greater confidence in the efficiency of naval gunfire, in the dive bombing by carrier aircraft, in the quality of the close air support provided to the Marines, as well as a deeper appreciation of the essentiality of landing the troops at the appointed time and spot to facilitate the Marine and Army Scheme of Maneuver. During the New Georgia amphibious operation an operational technique was developed which carried through the Central Pacific campaigns and on into the planning for the final attack on the Japanese homeland. This technique was pointed towards seizing toe holds on nearby islands close to but not so well defended as the main objective and making a key part of the major assault on the main objective direct from these toe holds rather than from far across the sea. They also provided a place from where artillery support could be supplied from on a round-the-clock basis. Further increases in personnel as well as cleaner command lines were again tried in TOENAILS. They paid off. When all was said and done, Rear Admiral Turner worked his head off in the logistical battle of the Lower Solomons and in the move to the Middle Solomons. The record of dozens of letters indicates this. It was after this initial phase of a rough and tumble contest with a first-class fighting Japanese Navy was over and won, that Rear Admiral Turner started to find in a nip at the bottle the necessary uplift to willingly wrestle another four or five hours of work each day after completing a normal 12 hours. He was drinking 'off hours.' On a couple of occasions it came to my attention. However, I do not believe it affected his efficiency the next day, except to make him more irritable than usual. That was par for the course. It should be noted here that some of COMINCH planning assistants did not think Vice Admiral Halsey's final plan for TOENAILS was bold enough and made their concern a matter of record. A draft JCS despatch, calling for assault landings at Vila and Munda airfields with an attached supporting memorandum, was sent up the line in the COMINCH Plans Division to Admiral King some six weeks before the landings. It also might be added that CINCPAC had preferred that the large transports not be employed for the assault landing in TOENAILS, because of the lack of strong air cover over the landing areas and a decent respect for Japanese air capabilities. Every morning at 0900, COMSOPAC (Admiral Halsey), who was based ashore, held a conference in his office, attended by his C/S and other Commands ashore (Service Commands, for instance), Senior Marine Ashore and Unit Commanders Afloat. I accompanied Admiral Turner to these conferences as did Jack Lewis and Jimmy Doyle. In general, I would say that the period from January to May 1943 was one of enforced marking time as far as the Amphibious Force was concerned. Everyone wanted to get beyond Guadalcanal but the time didn't seem propitious, mostly because of the lack of the material that was needed. Both Admirals Halsey and Turner were eager to get going and make further advances to the North. Admiral Turner, however, would not set any time for such an operation as he felt that we did not have the ships or material at hand to make any such advance successfully. I think it was early March that part of our Force was taken away from us. COMSOPAC received orders from COMINCH to transfer 2 APs and 2 AKAs and 1 division of troops to General MacArthur. The ships were to augment the Amphibious Force being built up by Dan Barbey in the SW Pacific. . . . In view of the successes achieved and lives saved, no more popular strategical concept came out of the Pacific War than that of by-passing Japanese-held islands or positions and letting the Japanese threat "die on the vine," while our forces directed their efforts at Japanese closer to the Japanese homeland. The popularity has led to many claims as to who was the originator. This researcher has no idea who was the originator, but having read many thousands of despatches relating to the Pacific War, the first despatch in which he saw the expression used was in a despatch of Vice Admiral Halsey's (COMSOPAC' s 110421 of July 1943) addressed to Rear Admiral Turner and asking his comments and recommendations thereon. 1. COMGEN New Georgia Occupation Force, Field Order 3-43, 28 Jun. 1943, para. 1(b). 2. CTF 31 Op Plan 8-43, Annex A, para. 53. 3. Quoted in Driscoll, Pacific Victory, pp.66, 67. 3a. COMTHIRDFLT to CTF 31, 020050, 022300 Jul. 1943. 4. Commander Third Fleet, Narrative Account of the South Pacific Campaign, Ser 021 of 3 Sep. 1944. 5. COMAIRSOLS to CTG 36.2, 290835 Jun. 1943. 6. (a) LCI Flotilla Five War Diary, 29 Jun. 1943; (b) Landing Craft Flotillas, SOPAC, War Diary Jul. 1943; (c) LCI Group 13 War Diary, Jul. 1943. 7. Morison, Breaking the Bismarcks Barrier (Vol. VI), pp. 144-46. 8. 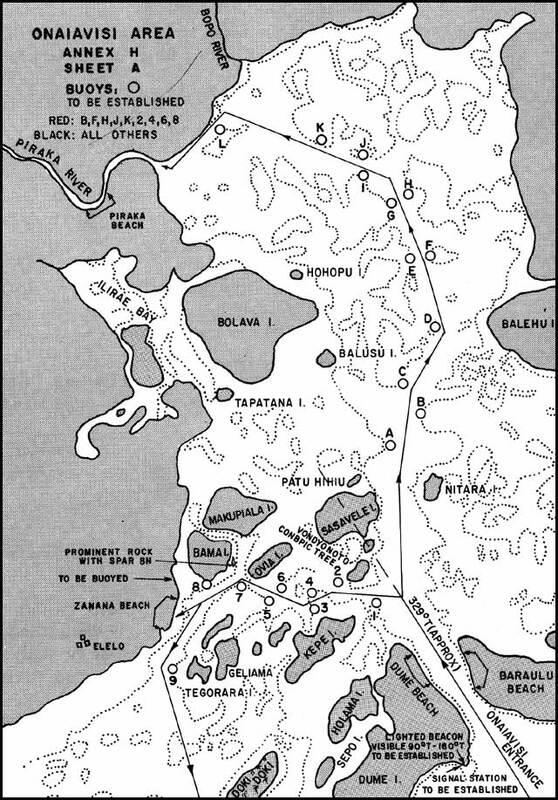 CGFIRSTMARDIV, Final Report on Guadalcanal Operation, Phase V, p. 6. 9. Talbot, Zane, Rail, Ship's Logs. 10. CTF 31 War Diary, 30 Jun. 1943. 12. Miller, The Reduction of Rabaul (Army), p. 88. 13. New Caledonia to War, No. 1133 of 1 Jul. 1943. 14. Buchanan Action Report, Ser 00124 of 11 Jul. 1943, pp. 3-4. 15. (a) COMAIRSDOPAC War Diary, Apr.-Jun. 1943; (b) COMAIRSOLS 301252 Jun. 1943. 16. 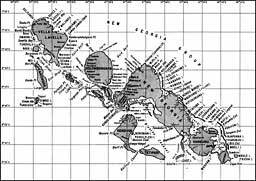 (a) Shaw and Douglas, Isolation of Rabaul (Marine), pp. 82, 83; (b) McCawley War Diary; (c) CTF 31 War Diary. 17. (a) CINCPAC Command Summary, Book Four, 1 Jul. 1943, p. 1613; (b) COMTHIRDFLT 010630 Jul. 1943; (c) President Jackson, McCawley, CTF 31, CTF 33 War Diaries, Jun. 1943. 18. COMAIRSOPAC Op Plan 7-43, 18 Jun. 1943 and related despatches. 19. Jenkins Action Report, Ser 0336 of 9 Jul. 1943. 20. 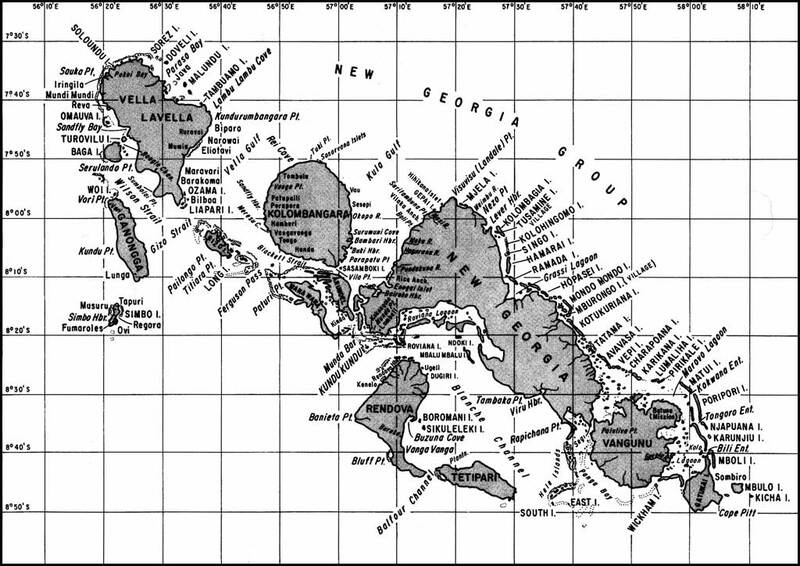 (a) Shaw and Douglas, Isolation of Rabaul (Marine), pp. 85, 87; (b) Miller Reduction of Rabaul Army, p. 91. 21. McCawley, President Jackson War Diaries. 22. Shaw and Douglas, Rabaul (Marine), 82. 23. CTF 31 to CTG 31.3, 022150 Jul. 1943. 24. LST Flotilla Five War Diary, 1 Jul. 1943. 26. APc-24 Action Report, 15 Jul. 1943. 27. LCI Group 15 War Diary, 4 Jul. 1943. 28. McCawley Action Report, Ser 002a of 4 Jul. 1943. 29. COMGENSOPAC to COMSOPAC, memorandum, 11 Jul. 1943. 30. Rear T.S. Wilkinson, USN, to CTF 31, Report on loss of McCawley, 3 Jul. 1943. 31. COMMTBRON Nine to Commander Naval Base, Rendova, Action Report, Ser 001 of 1 Jul. 1943. 32. McCalla Action Report, Ser 33 of 2 Jul. 1943. 33. Rear Admiral Robert H. Rodgers, USN (Ret.) to GCD, letter, 20 Nov. 1965. Hereafter Rodgers. 34. TG 31.3 Op Order AL10-43, 21 Jun. 1943, para 3. 35. COMGEN, New Georgia Occupation Force Field Order 3-43, 28 Jun. 943, Annex 2. 36. 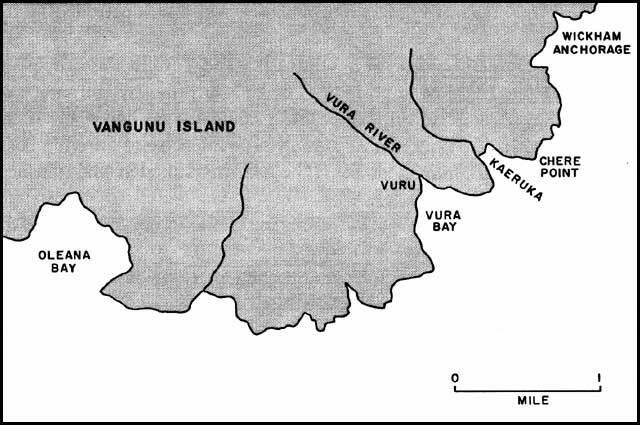 (a) Shaw and Douglas, Isolation of Rabaul (Marine), p. 72; (b) Miller, Reduction of Rabaul (Army), note 9, p. 137. 37. (a)N Interview with Rear Admiral Stanley Leith, USN (Ret. ), Jan. 1961. Hereafter Leith; (b) Deck Logs. 38. Crosby Deck Log, 30 Jun. 1943. 39. (a) Guadalcanal to COMINERON Two, 290805, Jun. 1943; (b) COMINERON Two, letter, Ser 00121 of 10 Jul. 1943, subj: Viru Occupation; (c) CTF 31 to COMSOPACFOR, 010035 Jul. 1943. 40. Crosby Deck Log, 30 Jun. 1943. 41. (a) Crosby Deck Log, 2 Jul. 1943; (b) COMINERON to CTF 31, 012358 Jul. 1943. 42. APc-27 War Diary, 1-2 Jul. 1943. 43. (a) Staff Inverviews; (b) Fort. 45. CTF 31 to COMSCOFOR, 031255 Jul. 1943. 46. CTG 31.3 to CTF 31, 020055 Jul., 1943. 47. (a) CTF 31 to COM 3rd Fleet, 010035 Jul. ; (b) COM 4th Raiders to CG 43rd, 01060 Jul. ; (c) CTF 31 to CTU 31.2.2, 012135 Jul. 49. AIRSOPAC War Diary, 3 Jul. 1943. 50. CTF 31 to comsopac, 02225 Jul. 1943. 51. (a) CTG 36.1 Op Order 10-43, 1 Jul. 1943; (b) CTF 31 020242, 020422, 020556, Jul. 1943; (c) CTG 31.1 Op Order, A11-43, 10 Jul. 1943. 54. COMTHIRDFLT to CINCPAC 070626 Jul. 1943. 55. (a) CTF 31 to Rendova, 070320 Jul. 1943; (b) Rendova to COMSOPAC to CTF 31, 080121 Jul. 1943. 56. (a) COMTRANSDIV 22 War Diary, 12 Jul. 1943; (b) CTF 31, 110370 Jul. 1943. 57. (a) CINCPAC to COMINCH, 30507 Jun. 1943; (b) BUPERS to CINCPAC and COMSOPAC 140833 Jun. 1943. 58. (a) CINCPAC to COMINCH, 130507 Jun. 1943; (b) COMINCH to CINCPAC, 241301 Jun. 1943; (c) CINCPAC Command Summary, Book Three, 24 Jun. 1943, p. 1610. 59. Miller, Reduction of Rabaul, (Army), p. 120. 61. COMSOPAC to CTF 31, 090502 Jul. 1943. 62. RDO Rendova to COMGENFORCES SOPAC 1380820 Jul. 1943. 63. CTF 31 to COMSOPAC, 131400 Jul. 1943. 64. CTF 31 to Radio Rendova, 131510 Jul. 1943. 65. CTF 31 to COMSOPAC, 131400 Jul. 1943. 66. COMTHIRDFLT to CINCPAC, 132320 Jul. 1943. 67. COMTHIRDFLT to CTF 31, 132220 Jul. 1943. 68. Commander Landing Craft Flotillas to COMPHIBFORSOPAC FE 25-2/A3/Ser 002 of 13 Jul. 1943, subj: Performance of Landing Craft. 69. CTG 31.1 Loading Order 14-43 12 Jul. 1943. 70. Commander Landing Craft Flotillas, letter, 13 Jul. 1943. 72. (a) Turner; (b) Morison, The Rising Sun in the Pacific (Vol. III), p. 199; (c) COMGENFIRSTMARDIV, Final Report on Guadalcanal, Phase V, p. 6. 73. (a) Staff Interviews; (b) CTF 31 Op Order A9-43, 15 Jun. 1943, Appendix (1) to Anex G.
74. COMTRANSDIV Eight to COMPHIBFORSOPAC, letter, Nov. 1942. 75. Captain Clarence E. Olsen, USN, to ACS (Plans), memorandum, 6 Aug. 1943. 78. Driscoll, Pacific Victory, pp. 58, 59. 79. RKT Medical Record,m 1942-1943. 83. (a) COMINCH to COMSOPAC, 081329 May 1943; (b) COMSOPAC to COMINCH 090501 and 160420 May 1943; (c) Assistant Chief of Staff Plans to Admiral King, memorandum of 21 May 1943; subj: COMSOPAC TOENAILS plan. 85. Washington Post, 14 Feb. 1961.